Ms. Whitford is the chair of the Blackfeet Studies Department at Blackfeet Community College in Browning, Montana, where she teaches humanities, history and Blackfeet women. Ms. Whitford has authored articles and other materials to help promote Indian Education for All. 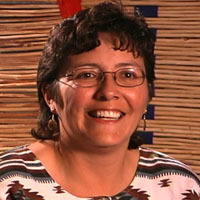 In her interview, she provides the Blackfeet side of the negotiations for the 1855 Lame Bull Treaty. 1855 Lame Bull Treaty and the Blackfeet - Lea Whitford.